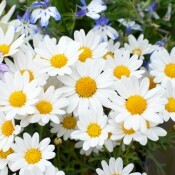 The Marguerite Daisy is a time-honoured favourite. This group of plants gives free reign to the imagination with every type of application possible. 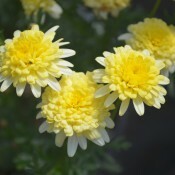 Argyranthemums can be used in mixed containers, as an accent to specimen plants or to add a splash of colour. They are pretty planted in large container groupings or in window boxes and will bloom until hard frost. Remove spent blossoms for continuous bloom. They make excellent cut flowers. 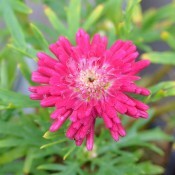 Butterfly is one of the best Argyranthemum cultivars available today. 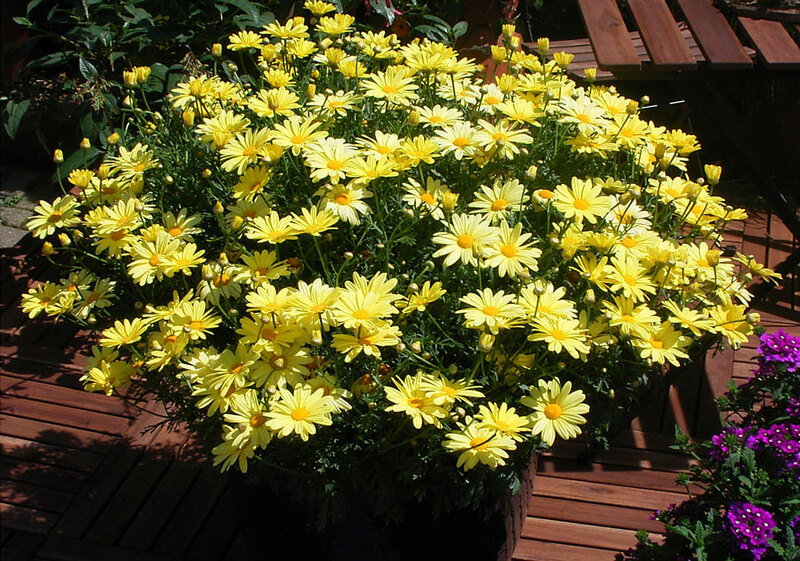 Excellent garden or container grown yellow marguerite that blooms all summer. Extremely weather tolerant. Great in pots and containers. Cabernet Serenade has attractive, semi-double dark burgundy flowers that bloom through spring and summer. It is a fantastic garden performer with early flowering, excellent branching, and great heat tolerance. Looks nice in garden borders, rock gardens, landscape gardening, and mixed containers. Lemon Drops has double yellow flowers and is heat tolerant with medium-high vigour. This variety has excellent branching and is early flowering. For use in garden borders in background planting, rock gardens, landscape gardening and perfect for mixed containers. Lovey Dove is compact with snow-white petals surrounding golden centers. 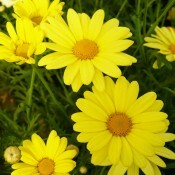 It has excellent tolerance to extreme weather conditions and to diseases. Excellent for landscapes, pots or planter boxes. Early, non-stop blooms of large single flowers. 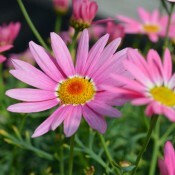 It adds brightness and cheer with its beautiful pink petals and bright yellow hearts. These low maintenance plants have excellent tolerance of extreme weather conditions and are resistant to diseases. They are an exceptional choice for landscapes, pots, planter boxes and mixed containers.